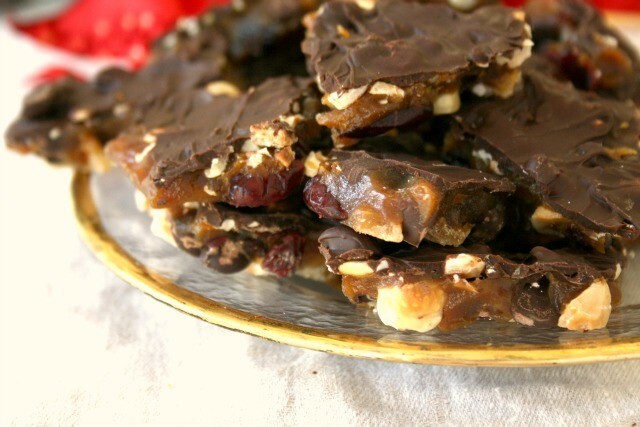 I grew up eating a delicious toffee concoction called Fredericton Walnut Toffee. The recipe is from the excellent The Laura Secord Canadian Cookbook and it’s a holiday favourite in our house. 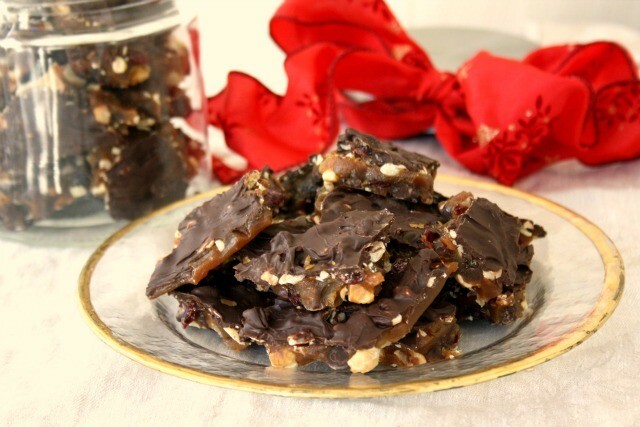 This Cranberry Hazelnut Buttercrunch Toffee recipe is a variation of that iconic toffee. It has crunch and that irresistible butterscotch flavour, but the addition of hazelnuts, dried cranberries and candied ginger makes it extra festive. Hazelnuts can sometimes dominate in a recipe but here they’re a bit subdued in the lovely flavour trio they create with the cranberries and candied ginger. The chocolate is nice but the whole amount is unnecessary. Depending on your mood and preference, you can reduce the chocolate by half so omit it from the first layer and save it for the top. Also, I prefer my buttercrunch on the thin side so spread this mixture out on a cookie sheet. If you like your buttercrunch thicker go with the 9”x13” pan for this recipe. The recipe is adapted from King Arthur Flour. Their version called for corn syrup, of which I am not a fan. 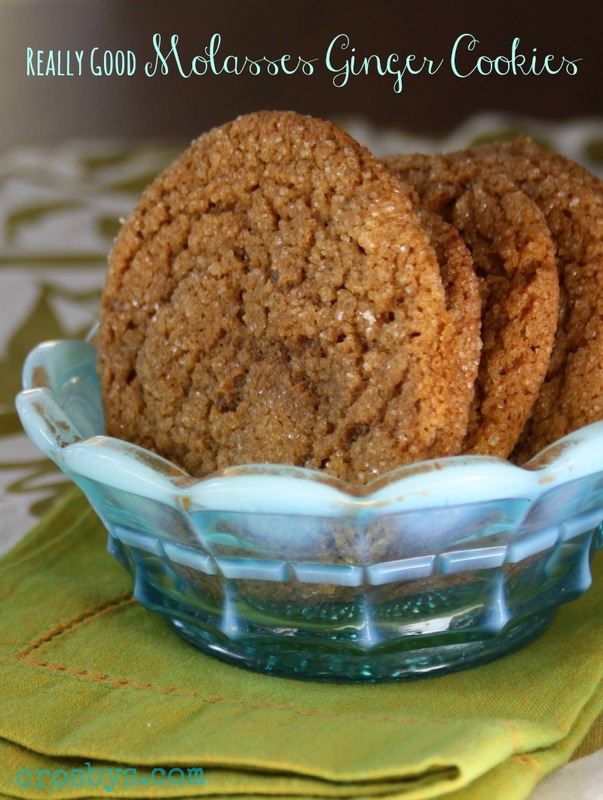 Fancy molasses is a natural, and wholesome, substitute for corn syrup. Line a 9”x13” pan or cookie sheet with parchment paper or grease it well. Combine nuts, cranberries and candied ginger in a bowl and stir to mix. Pour half of the nut mixture into the prepared pan and spread evenly. Sprinkle over half of the chocolate chips. In a medium pot, over medium heat, melt the butter, stir in the salt, sugar, water and molasses and bring mixture to the boil. Boil gently without stirring until the mixtures reaches 300 F (hard crack stage). If you don’t have a candy thermometer test the caramel by dropping a dollop in a glass of cold water. If it hardens quickly and is brittle or breaks like hard candy then it’s ready. If it has some softness to it then it still has a little cooking to do. Watch it closely near the end so it doesn’t burn. When the toffee is ready pour it evenly over the nut mixture in the prepared pan. Sprinkle over the remaining half of the chocolate chips and then the remaining nut mixture. After 5 minutes or so, with the back of a wooden spoon or silicone spatula, gently press on the top mixture to spread the chocolate around. Leave to cool then break into chunks. Store in an airtight tin for up to three weeks. *Using only half of the chocolate chips is nice too. Omit them from the base layer (step 3) and save them for the top layer (step 7). 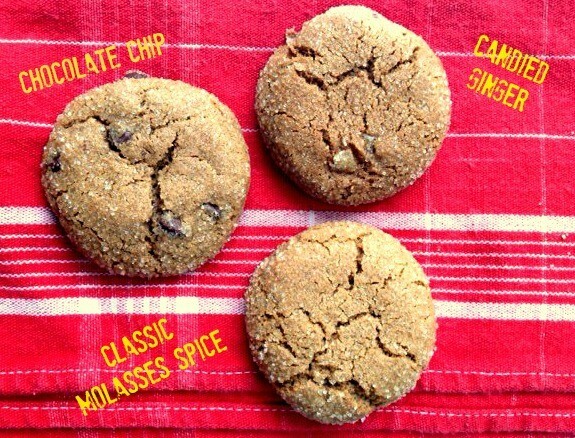 Turn one batch of cookies into three with this versatile Molasses Spice Crinkle Cookie recipe. This is a great recipe for the indecisive baker. You know, those days when you want to bake something sweet but can’t decide on a recipe. It’s a classic molasses cookie recipe that can go in all sorts of directions. I have three suggestions here but the variations are infinite. In in the mood for chocolate? 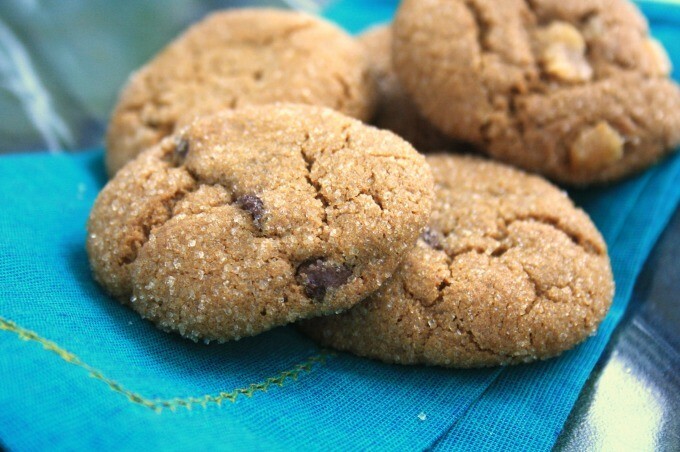 Turn these into molasses chocolate chip cookies. Or if you want to add an extra bite of spice and chewiness you can toss in some candied ginger. 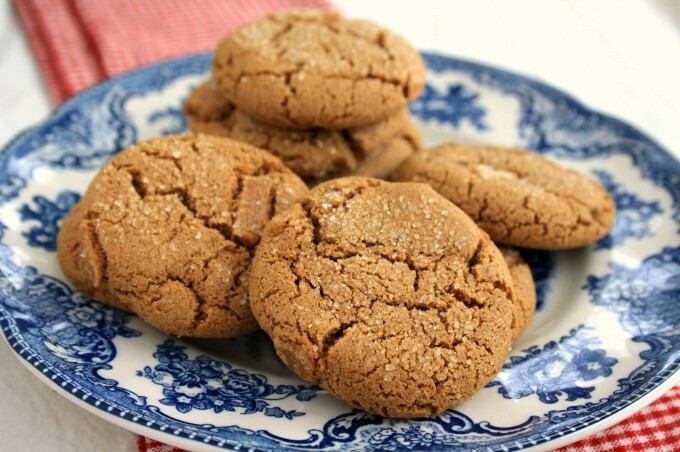 Or they’re lovely on their own as simple molasses spice crinkle cookies. This recipe would work with orange zest too, or white chocolate chips. May be add a little coffee or plunk a Hershey’s Kiss in the middle. In a medium bowl, combine flour, baking soda, salt, and spices. In a large bowl beat together butter and both sugars until light and fluffy. Beat in molasses, egg, and vanilla. Add the flour and spice mixture and mix just until dough comes together. Refrigerate dough for 30 minutes or preferably overnight (if you have time). Preheat oven to 3750F and line baking sheets with parchment paper. Scoop dough into walnut-sized balls and roll in sugar to coat. Gently flatten the ball with the bottom of a glass or mug. Bake 10-12 minutes until firm (don’t over bake). I’m always baking cookies. The house is full of them, the freezer is full of them and I cart them to work and I sometimes send them with my kids when they head off to visit friends. I realised that I don’t often get the chance to sit back and enjoy cookies that someone else has made. I had forgotten the simple pleasure of nibbling a cookie without having first mixed it up, put it in the oven and tidied the kitchen. And then I met these cookies, made by my friend Joan for our book club anniversary potluck. 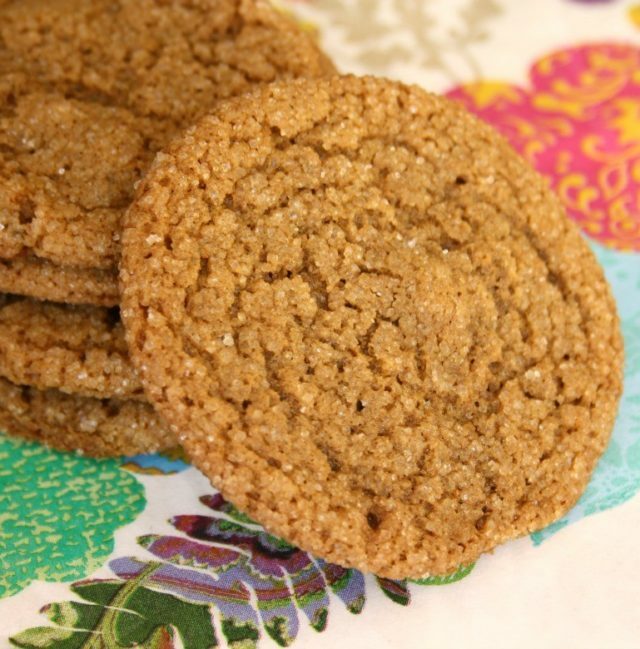 They’re a classic ginger molasses cookie with a great spice blend and lots of candied ginger. In fact, the original recipe called for more than a cup of candied ginger. I cut it back to 1/3 of a cup but feel free to add more if it suits your palate. This is a chewy cookie too, with a lovely crackled top. This is not a buttery cookie though. With just 1/4 cup of oil the richness comes just from the sugar and molasses. It makes them good traveling cookies. In a large bowl, whisk flour, baking soda, cinnamon, cloves, nutmeg, ginger, and salt. In another bowl beat the brown sugar, oil, and molasses on medium speed for 5 minutes. Beat in the egg on low and beat for a minute or two. Add the dry ingredients in two batches and mix until well combined. Stir in the crystalized ginger. Roll dough into walnut-sized balls, flatten lightly and dip top and bottom in granulated sugar. Bake on a parchment-lined cookie sheet for 12-13 minutes. 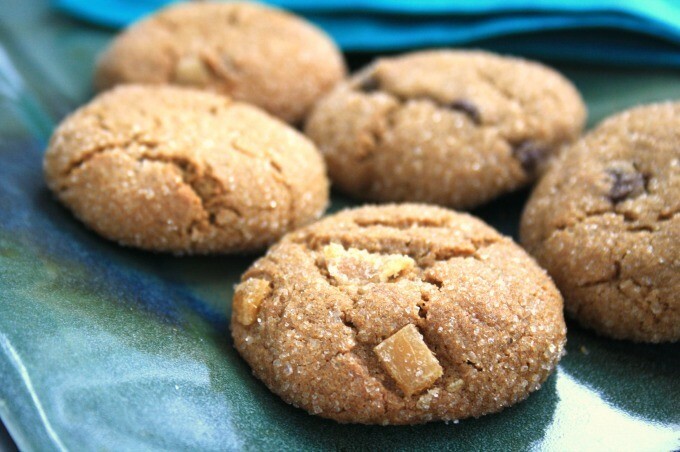 If you’re a chewy cookie fan this recipe is for you. Ditto if you love ginger. 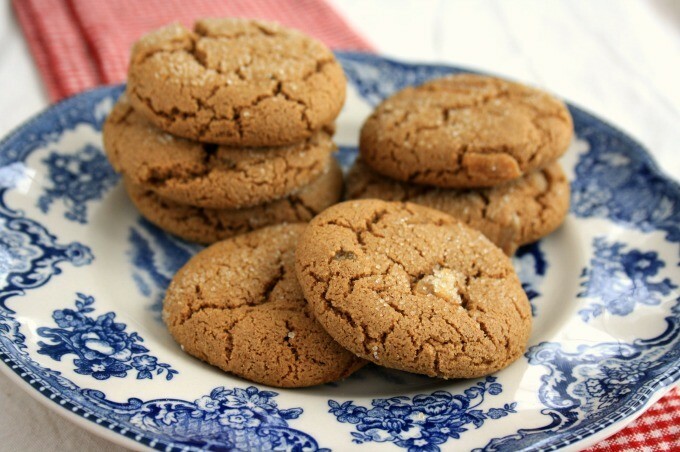 This is a recipe from my friend Sandra who called the cookies “Really Good Molasses Cookies” because that’s what they’re called on her hand-written recipe card. 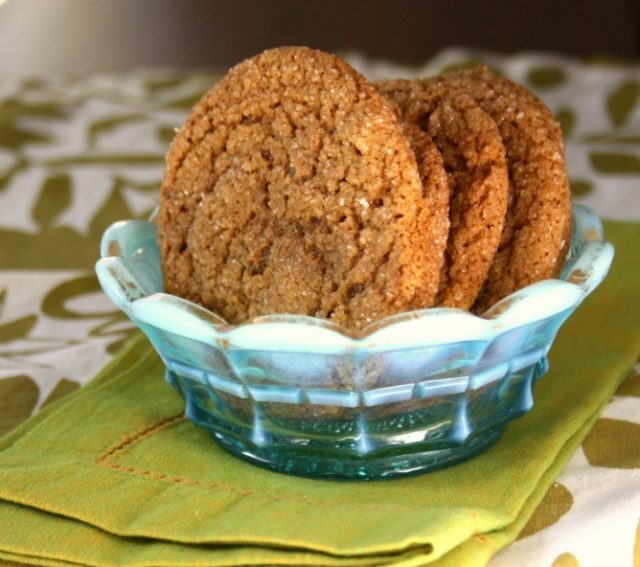 Plus, they are really good molasses cookies. Chewy, with that lovely crackled top. That’s the great thing about hand-me-down recipes.  Unlike hand-me-down clothes (such as the ones that I grew up wearing from my older sisters and cousins), recipes that have been passed along from family and friends are always favourites and welcome additions to your recipe box. My horrible hand-me-down clothes are chronicled in my annual school photos. They weren’t old enough to be cool or vintage and weren’t current enough to be made of natural fibres, so there I sit in my school photos with the tacky landscape background in scratchy polyester pantsuits. 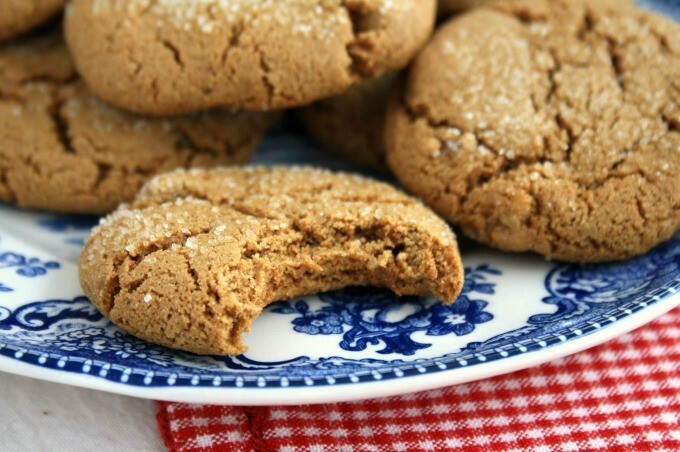 Adding balsamic vinegar to molasses cookies was my mom’s idea. 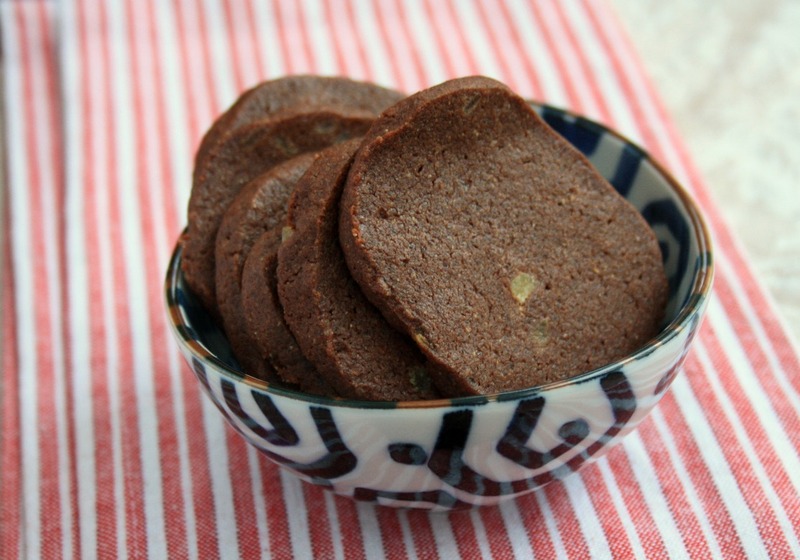 She discovered a balsamic cookie recipe years ago and we have been enjoying it ever since in her molasses-meets-Italy cookies that I’ll feature one of these days. In a large bowl cream sugar and butter until fluffy. Add eggs one at a time, mixing well after each addition. Mix in molasses and balsamic vinegar. In another bowl, whisk dry ingredients. Add dry ingredients to creamed mixture about a cup at a time, mixing well. Stir in candied ginger. Form into 11/2″ balls. Roll in sugar. Tip: No need to use whole wheat pastry flour if you don’t have any on hand. The original recipe called for all-purpose flour only. We enjoyed a real old fashioned snow storm on Sunday followed but two more storms. School was cancelled yesterday and today, and messy weather forecasted for tomorrow. My kids have taken to jumping off the garage roof into the huge snow piles. It’s strictly forbidden of course but I did the same when I was their age so I’m having trouble policing it. And truth be told, I’d really like to jump off the roof into those mountains of snow myself. On these snowy evening I have been filling the house with the smell of cookies baking. 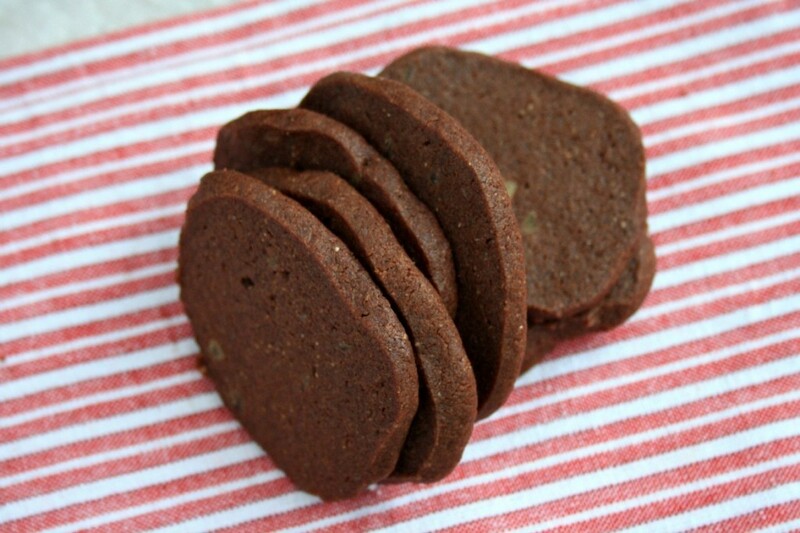 These chocolate gingersnaps are my latest discovery. Made as icebox cookies they’re crispy wafers studded with crystalized ginger. You can store the dough in the fridge or freezer and bake them on a whim. To mix up the dough the method will seem unorthodox at first, since you toss everything together at once rather than creaming the butter and sugar and adding from there. The dough will seem impossibly crumbly and bits of it might even fly around the kitchen as the beaters spin. But the dough will come together and you’ll be able to shape it in a log and get on with the chilling and baking. In a large bowl combine flour, both sugars, baking soda, cornmeal, and cocoa powder. With the beaters on low add vanilla and butter. Pour in molasses. Mix until the dough comes together (it will seem very crumbly at first). Stir in candied ginger. Form dough into a log, wrap in plastic and refrigerate for at least an hour. 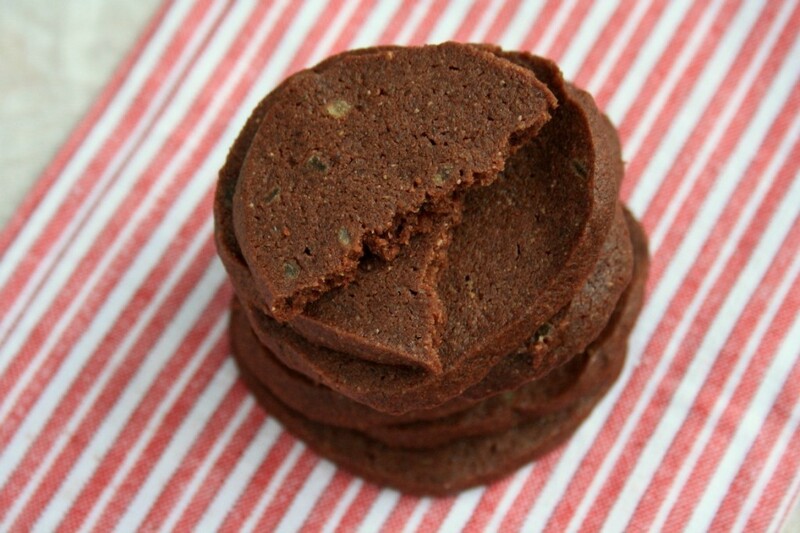 Cut dough into 1/4“ slices and place on a parchment lined cookies sheet. Bake 10-12 minutes. Cool on the baking sheet. 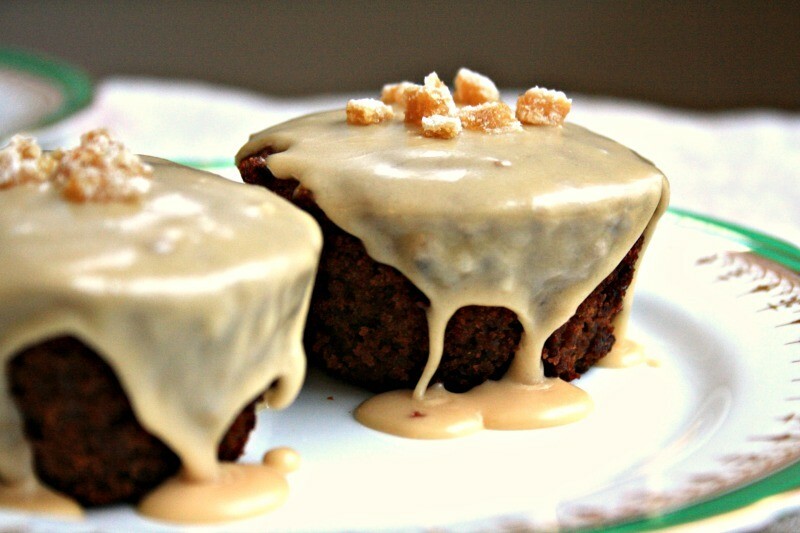 Guinness Gingerbread Cupcakes with Baileys glaze show off the perfect pairing of ginger and Baileys Irish Cream. An easy and impressive dessert. When I was growing up we always had candied ginger in our house. It was a favourite of my mom’s so was a staple in the cupboard alongside the candied peel, cherries and angelica. As a child I thought its dry sugary coating made candied ginger seem like some sort of exotic candy from long ago. Candied ginger makes Guinness Gingerbread Cupcakes a little special. Candied ginger is delicious dipped in dark chocolate and is pretty when diced and sprinkled on cakes but when tucked into baked goods (like these Guinness gingerbread cupcakes) it gives an unexpected hit of chewy sweet heat. Served with or without the Baileys glaze, they make a lovely dessert to top off a mid-March meal. Line a standard 12-cup muffin tin with cupcake liners & preheat oven to 350 F.
Bring the stout, molasses, and oil to a boil over medium-high heat. Stir in the brown sugar, then let cool. In a small bowl, whisk the flour, baking powder, ginger, cinnamon, cloves, and salt. Gently stir in the minced candied ginger. Spoon into prepared pan and bake 22 to 24 minutes. Cream the butter with a tablespoon of icing sugar. Add the Baileys and vanilla then continue with more icing sugar until you get a spreadable consistency that slowly runs off a spoon. Spread on cupcakes right to the edge so the extra dribbles down the side. 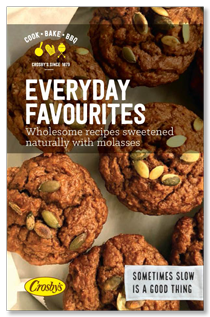 If you’re a fan of gingerbread you’ll love our gingerbread e-book full of timeless favourites. When you reach our gingerbread page just double-click the e-book to view or download. No e-reader required.